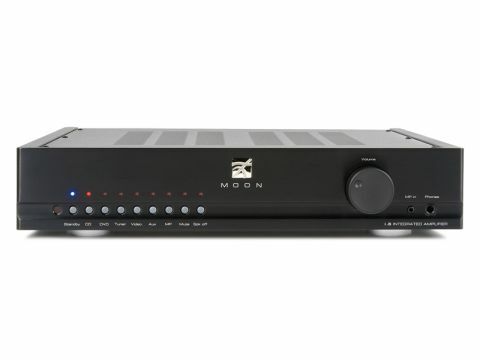 Moon is a brand of Canadian manufacturer Simaudio, which has been plying its trade for nearly 30 years. The range is slanted towards the high end, but features a few distinctly affordable products, of which the Moon i5 is one. Don't confuse this model, by the way, with the i-5, which was a considerably more upmarket amp, now replaced by the i-5.3. The 'i-point-five' is clearly considered as a stepping stone to the i-1, which in turn was once the Moon entry point. One area in which the entry-level status shows up is the relatively low power rating – just 40 watts into the normal 8 ohms notional loudspeaker impedance. Is this a big limitation? Actually, as our Lab Report shows, it's a very conservative rating and, in practice, there's a good few watts more available, but it's worth bearing in mind that the difference between 40 and 80 watts is only 3dB, or three steps on a typical electronic volume control. And while with inefficient loudspeakers, in a large room, every decibel is precious, most current speakers in most UK-size livings rooms will play at more than satisfying levels with less than 40 watts on tap. Because the output is relatively modest, Moon has been able to dispense with the usual heatsink and just dump waste heat into the case, as a few other manufacturers do with similarly rated amps. Cost saved there has been put into other areas, notably the mains transformer which is particularly large. The main circuit board features mostly discrete transistors, with just a couple of op-amps and two more integrated circuits handling input switching. The volume control is a traditional mechanical one, motorised for remote operation. Input provision is decent, with five line-level inputs at the rear and a 3.5mm jack socket at the front: there's no recording output but you do get pre out and a headphone socket, plus single speaker terminals. If this amp caused some disagreement between our listeners, it still united them on the subject of its bass, which is firm, extended, lively and tuneful. It's a good start, but performance in higher registers doesn't always quite match it and there is, at times, a degree of congestion and dryness that detracts somewhat. As a result, reactions once again vary according to musical and sonic taste. One of our most successful tracks over many group tests has been the opener from Michael Jackson's Thriller, which in some ways (not all though!) is a very fine piece of sound engineering. It has loads of bass, well-placed vocals and a very busy texture, all of which provide plenty for a piece of audio electronics to deal with. In this case, the bass sounded highly convincing and suitably energetic, but the vocal line was surprisingly hard to latch on to and follow. The many instrumental lines in the mix were better defined, though, and there was a good sense of dynamics. Clearly one's reaction to that will depend on whether one hears bass or vocals first and foremost. Trying a selection of tracks, we found some consistency in the i.5's uncertainty with voices. Funnily enough it seems relatively happy with choral voices, but where there is a solo voice with instrumental accompaniment it is often the latter that dominates. Returning to the blind session, instrumental only tracks also divided opinion. There was a suspicion of confusion in Kind of Blue, whereas the Rachmaninov shone out in brightly lit colours with good spatial separation of the orchestra. In fact, over an extended listening session, we felt that there is quite a lot about this amp that is understated: it does grow on you and we ended up quite fond of it. Voices do continue to be something of an Achilles Heel, though.